This was an impromptu sort of dinner. I had gotten a couple things out of the freezer the day before – a smoked andouille sausage (left over from the cassoulet) and a container of pesto from a long-gone summer. There was a bunch of (very non-local) asparagus in the fridge that I had bought on spec and done nothing with, and half a box of macaroni sitting in the cupboard. So, making it up as I went along, I put on pasta water to boil and put together a small pan of bechamel sauce. Once the sauce was thickened I stirred a heaping spoonful of pesto into it. I warmed up the andouille and sliced it thinly, and chopped the asparagus into inch-long pieces. When the macaroni was almost cooked, I dropped the asparagus into the water with the pasta to blanch it, then drained it all at once. 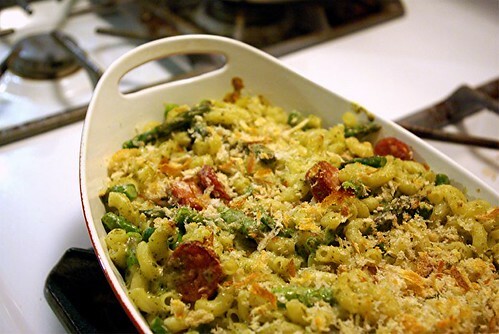 I mixed the macaroni and asparagus with the pesto bechamel and the sliced sausage in a gratin pan, then grated fresh parmesan over it all and sprinkled breadcrumbs on top. I let it sit in a 450° oven for ten minutes or so until we got hungry and ate it. Not the sort of dinner I make very often, but strangely comforting. And easy, too.